Though most bench grinders will get the grinding job done, you need to pay attention to some details if you are looking to purchase a bench grinder for the purpose of woodturning. You might want to consider a bench grinder with wheels that are a minimum of 6 inches. Any bench grinder with wheels that are 5 inches and below are likely to be underpowered. Also the smaller radius of wheel’s curvature can produce a hollow grind on the bevel of the tool. A bench grinder with 8 inch wheels is ideal for woodturning, if you are willing to spend a little bit more. Many professionals who use bench grinders for wood turning prefer to customize the wheels as per their need as it protects expensive high speed steel tools from damage. You might also want to consider investing in a wheel that is made with material that prevents overheating that can considerably affect the lifespan of the tools. Avoid the wheels that are made with unrefined aluminum oxide grit. Those are exceptionally hard and mainly designed to grind carbon steel. These wheels can cause severe damage to premium quality high speed steel (HSS) turning tools. Preferred choice of wheels would be pink or white wheel made with aluminum oxide. Alternatively, you can consider microcrystalline or blue ceramic wheels. If the price isn’t a concern, you can also opt for cubic boron nitride (CBN) wheels that are metal plated, as they deliver best results. Honing tools after grinding is always a good idea, as it makes the edge razor sharp. However, if you are using a microcrystalline wheel or a cubic boron nitride (CBN) wheel, you need not bother with honing the woodturning tools as these wheels make the edges optimally sharp. Mentioned below are the top three bench grinder that are the most preferred choice for woodturning. WEN has been making innovative and quality products since decades and are the preferred choice of most professionals in the wood working industry. WEN 4282 is a high speed bench grinder. It can shape, smoothen and sharpen tools. This bench grinder features a quenching tray. It helps to cool down the work-pieces through heavy volume work sessions. WEN 4282 features two wheels. One is an 80 grit wheel for fine grinding work such as cleaning, polishing, buffing, sharpening etc. The second wheel is 36 grit for coarse grinding work such as deburring metal of ragged and chipped edges or protrusions, removal of rust etc. WEN 4282 has a cast iron base. It also has mounting holes to fasten it on work surface or on a pedestal stand with bolts to prevent wobbling and provide better stability. Adjustable eye shields also feature in built LED lights for greater accuracy during grinding. The motor takes longer than expected to come up to speed. Advanced woodworkers and professionals alike, all prefer Delta Power Equipment as they have over 9 decades of expertise in making woodworking equipment. This bench grinder also features a water tray to help you keep the tools cool through grinding sessions. 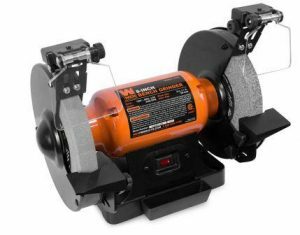 Online reviewers who have used this bench grinder have said that they found the tool rests uncomfortable to use for precise sharpening work and have invested in a jig instead of relying on the tool rest. RIKON 80-805 is a low speed bench grinder that can complete any grinding task with flawless results. Higher speed facilitates faster removal of unwanted material on the surface. Slower speed is good for precise results and offers a greater finesse – which is what is required when sharpening HSS tools for woodturning. RIKON 80-805 features a cast iron base, making it durable. Rubberized feet help absorb excess vibration as the motor runs making it more stable. 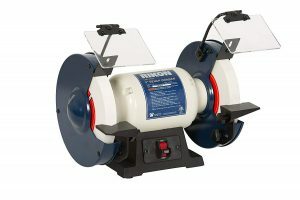 This bench grinder features two wheels made of white aluminum oxide. One is for coarse grinding and one is for fine grinding. Reviewers are of the opinion that this model works best on a fixed surface such as a work station or a table top. It tends to become wobbly when used on a pedestal. If the primary purpose of using a bench grinder is to use it for woodturning, you might want to consider investing in a jig. Even if you are an expert at using a bench grinder, you will notice that you get much better results using a jig. Also the tool life will become significantly longer. 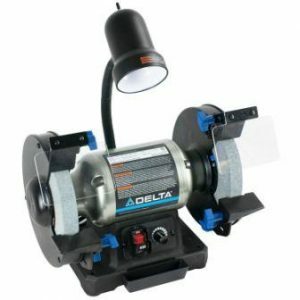 A good bench grinder for woodturning must have transparent flaps / eye shields, which are adjustable and can also be replaced in case they get scratches or develop cracks over time.The on / off switch should be dust proof and must be easily accessible. All tools and machines need maintenance. So do machines that maintain the tools. To maintain the grinding wheel in top condition, it needs to be dressed regularly. A T-Bar dresser (preferably multi diamond) helps you maintain the grinding wheels with least effort. Grinding and sharpening woodturning tools requires a great deal of concentration and attention to detail. It would be ideal to work with these tools in a well illuminated area for better results.